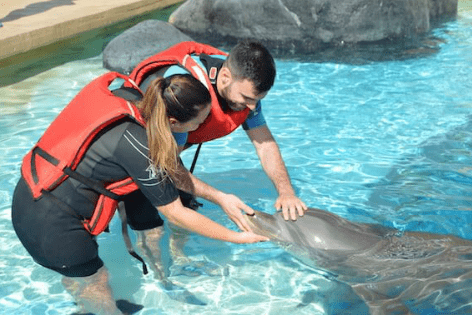 Rancho Texas Animal Park, is an animal and water park - this is a 'must visit' while you are in Lanzarote, including a unique opportunity to interact with adorable dolphins and sea lions. It's great value for the price of the entrance ticket - book online now for a fun family day out. The park is an impressive size and immaculate throughout and you will experience many exotic animal encounters, including white tigers, raccoons, snakes, bison, exotic birds, pot bellied pigs, donkeys, horses, armadillo, cougar, deer, goats, rabbits, raccoons, skunk and many more which live in recreated installations and spaces adapted to their natural habitats. 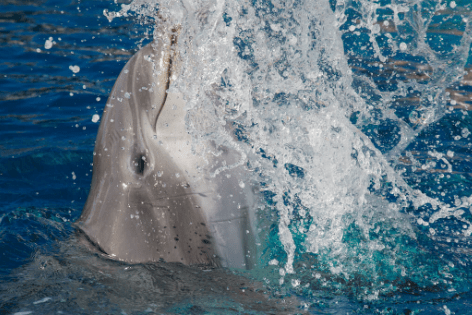 Rancho Texas runs popular shows at several times during the day - all included in the ticket price like the new Dolphin Show, the Cheeky Sealion show, a Live Birds of Prey Show and the Parrot show. The Dolphin Show: A unique opportunity for dolphin interaction, enjoy four adorable bottle-nose dolphins who arrived in Lanzarote in November 2016 from Duisburg and Nuremberg (Germany). Interact with these lovely creatures, or even steal a kiss and dance with them! Full on fun and an unforgettable and once in a lifetime experience for sure. The Sea Lion Show: Watch the sealion show where you can also interact with them. There is even a chance to swim with the sealions! 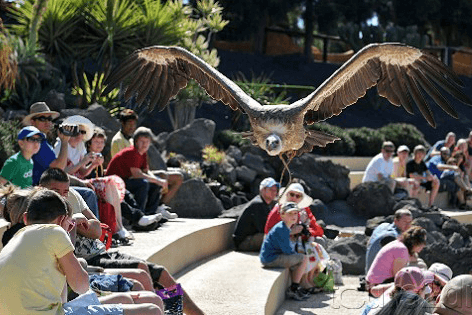 The Birds of Prey Show: At the Birds of Prey Show get carried away with breathtaking birds like eagles, speedy falcons, vultures even a condor (the largest of birds) fly over your head at very low distance! The Parrot Show: At the Parrot Show have a laugh while our clever parrots and cockatoos entertain you with their demonstrations. Rancho Texas Lanzarote Park also has a SPLASH ZONE water park. The splash zone (with swimming pools, slides and water activities) feels great after wandering around the park watching the shows. The splash zone is where you can cool off in the massive pool area with a huge splash bucket that fills up and splashes anyone who stands beneath it. It is a great option to cool down and relax in hot Lanzarote weather! Don’t forget to bring extra clothes, towels and sunscreen so you can enjoy the waterpark to its fullest. It also has two twisting slides which cascade down from the mountains, which is sure to get you wanting to try again and again. You can also go for a pony ride or take part in canoeing. After a great day at Rancho Texas Animal park, you can relax and eat. 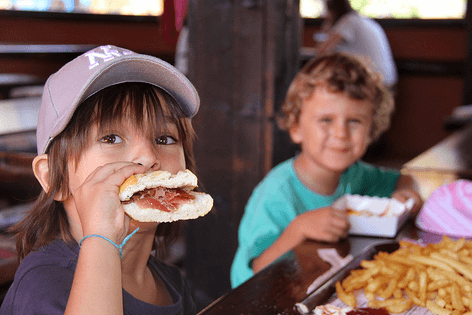 There are plenty of restaurants to choose from for food, sangria and soft drinks! There are also American-style meals or a menu meal at the Splash & pool area. Rancho Texas is always trying to expand and improve all their facilities so every time you visit you will find something new. Location: The theme park is located at Alcalde Cabrera Torres, s/n, 35510 Puerto del Carmen, Las Palmas. Lockers: Rancho Texas have lockers available for your personal objects in the Souvenir shop. To use this service just pay €2 and leave a deposit of €5 which will be refunded after returning the keys. Wheelchairs: The park also provides wheelchairs for less abled customers free of cost and can be obtained from the souvenir shop after filling in a utility form. Lost and Found: If you seem to have lost something during your visit in the park, don’t hesitate to pass by the main entrance where the park officials shall take your contact information to call you in case of finding said object. Customer Service: It is situated in the main entrance of the park. Bathrooms and Changing rooms: There are five restrooms available: In the entrance, changing area in the Splash Zone, the Pool Bar, Fast Food and in the Restaurant. First Aid: There are two First Aid medical kits: One is located in the Splash Zone aqua park and the other in the Restaurant. In case of Emergency please find said points or let one of our members of staff know and we can help you. Photos and Videos: Photos and Videos are allowed inside the park unless indicated otherwise by a sign or member of staff. If you wish to take home a souvenir of the exhibitions please use the park’s photo service that will take place at the show points indicated on the map before or after the exhibitions. You may locate these photos in the Souvenir shop at the exit of the park and can purchase photos at the cost of €5 per photo. Baby Buggy Parking: There are special areas available to park baby buggies, indicated in the Fast Food zone and by the shows. 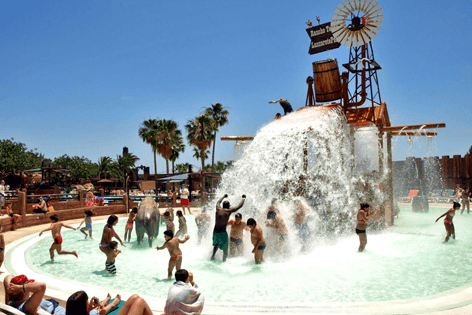 Rancho Texas Theme Park is an excursionlanzarote.com star excursion and comes highly recommended, especially with kids, for an unforgettable experience in Lanzarote. Being at Rancho Texas has to be one of the best Lanzarote excursions and will be a highlight of your holiday in the Canary Islands! 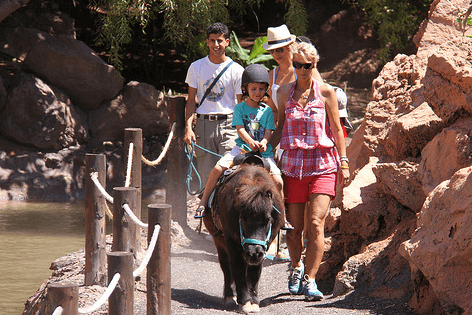 Definitely one of the best things to do in Lanzarote for all ages.